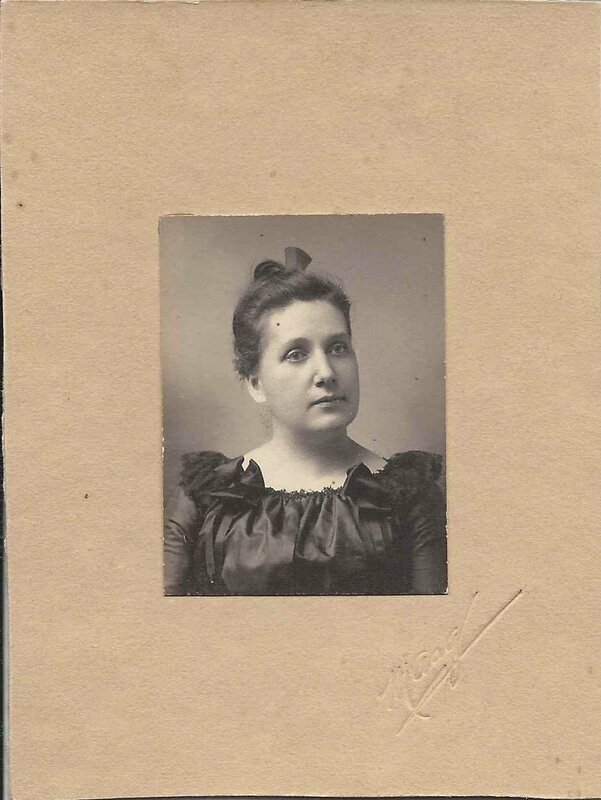 Small mounted photograph of a woman identified on reverse as Caroline (Agpar) Wharton. The imprint on front is that of the Maag studio, operated, I believe, by Ferdinand W. Maag of Keyport, New Jersey. 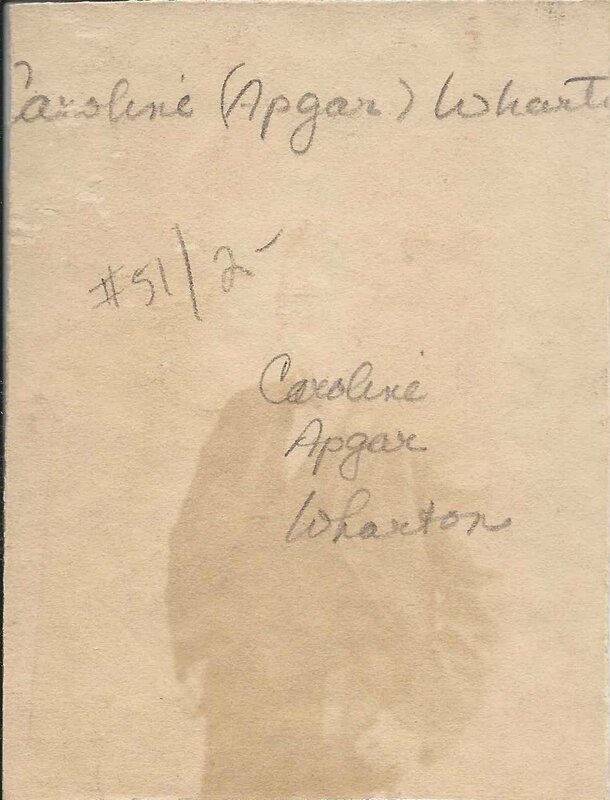 Caroline Apgar was born, according to New Jersey, Births and Christenings 1660-1980 on 29 July 1861 at Tewkesbury Township, New Jersey, daughter of Christopher Trimmer Apgar and wife Emily (Flomerfelt) Apgar, both born in Hunterdon County, New Jersey. The birthdate conflicts with her year of birth on her headstone, 1860. Either the birth record or the stone is incorrect, or the 1861 date is the date she was christened, on her first birthday. To further confuse things, there were at least two other New Jersey births in the 1860s for a Caroline Apgar or Carrie Apgar. Hopefully, I have chosen the correct Caroline, who went on to marry a Wharton. If you know that the woman pictured is not the daughter of Christopher Trimmer Apgar and wife Emily (Flomerfelt) Apgar, please leave a comment or contact me directly. Thanks! Caroline's paternal grandparents were Frederick and Catharine (Trimmer) Apgar. Her maternal grandparents were Leonard and Catherine (Apgar) Flomerfelt. On 10 March 1884 at High Bridge, New Jersey, Caroline married William Colter Wharton, son of Richard Bedle Wharton and wife Anna DeForrest (Luyster) Wharton. The couple made their home at Keyport, New Jersey and had at least two children. One of their children, Charles Russell Wharton, married Aura Mabel Conklin. 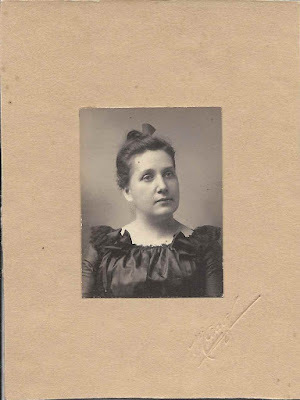 See another post that features two CDVs of Aura's mother, Emma Estelle (Drayton) Conklin. In the 1920 Census of Keyport, New Jersey, William was working as a trolley motorman. He died in 1929; Caroline died in 1946.